Speaking at the launch of Working with disaster. I am grateful for the opportunity, but also a little humbled by being the person to present something of a layperson’s perspective on the Working with Disaster report and the process behind it. I chair the Whittlesea Regional Council of the Uniting Church, the Whittlesea Uniting Church Council, and the Whittlesea Community Resilience Committee. Immediately following the 2009 bushfires, I chaired the Community Recovery Committee, the Combined Christian Churches of Whittlesea. I also coordinated bushfire recovery for the City of Whittlesea, and it was in this role that I first met Lisa Jacobson who was a member of our Bushfire Recovery Team. I have been supportive of the report from the time I first heard about it, and although I am a tad miffed to learn today that I have been replaced as Lisa’s favourite supervisor, I am pleased to be here today to indicate that support. I think developing the report was a good thing to do, because I have seen and been a close observer of the significant and varied impact of disaster on community-based clergy, most of whom are close friends. 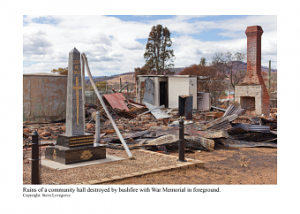 In my community, Whittlesea township and surrounds, there are five long-established churches, only one of which retains the minster who had tenure at the time of the 2009 bushfires. Of course the ministers have left for a variety of reasons, but some at least because of the continuing impact of the trauma associated with Black Saturday. The denominations responded in a variety of ways. The Presbyterian Church funded the operation of a drop-in shopfront in Whittlesea as a safe place for those impacted by the fires to drop in, find peace, respect, support, or simply a cup of tea. The Uniting Church provided a wonderful Community Bushfire Minister to work in and with the communities across the East Kilmore bushfire footprint. There was little welfare support given to most ministers by their denominational hierarchy, however. One denomination provided their pastor and his wife with the opportunity for respite interstate within supportive communities. I don’t think it is a coincidence that he is the only minister in the township who was there at the time of the fires, and remains at his post today. The Uniting Church Bushfire Minister and I met regularly for time-out and debriefing. Those times were greatly valued, and we felt effective. Looking back more than six years down the track, these self-generated meetings were the extent of the emotional, spiritual, and wellbeing support we received, other than that from families and friends. We might both have coped quite differently, and probably much less effectively, had we not found such a strong rapport. My impression is that, while official hierarchical churches may well have in place strategies for the professional development of people called to community ministry, there are few, if any, strategies for supporting ministers working in communities experiencing the trauma of disaster when those ministers themselves are severely affected by those same disasters. I find nothing in the report that conflicts with my own experience and observations, and I support its recommendations strongly. Today, however, I want to issue a challenge to people here and to the people for whom the report is intended. I was totally involved full-time in the business of community recovery, as well as volunteering out-of-hours for two years. I am still working for recovery on an out-of-hours basis. Throughout, I have retained my membership of and close involvement with my church and the combined churches of Whittlesea, maintaining my ‘normal’ church work and involvement. This includes eldership, preaching, leading services, visitation, and chairing church council and regional council meetings. Through these six years, no person, no office holder, no member of the clergy from Uniting Church Presbytery or Synod has ever asked “How are you going Ivan?”. My challenge to you all today is “What about the laity?” . Of course we need to care about the impact of trauma on the clergy, but what about the parishioners? We not only bore the brunt of the disaster and responded to it and the needs of the community, but we also responded to the needs of the clergy. We kept the churches going as safe havens for the community and in our community – a seven-day-a-week task. Our minister came to his very first appointment as a church minister almost exactly one month after the fires. It was a huge ‘ask’, and, in the circumstances, he himself needed intensive induction and ongoing support. Who supplied that? Who met that need, along with those of all the others? The laity. To this day, the only trauma support our church council members have received has been two group sessions with Stuart Stuart and his team. These came about only after months – actually years of repeated requests for help from our church hierarchy. While I found the sessions to be excellent, to be honest, for some it was too little too late. Lasting damage has been done. And there are no further sessions planned. So again my challenge is “What about the laity?”. Will we see another study and report called Who helps the helpers?